No excuses, Thirsty Reader, for my lollygagging, shilly-shallying and wool-gathering. Truth is, the Grandfather Dodge absorbs me. I have indulged in the joys of young Henry William Day Marsano whenever possible and not looked back. Still, my amends are due, so here is the promised screed on aeration [decanting will have to wait]. Aeration is not letting wine breathe but making it. 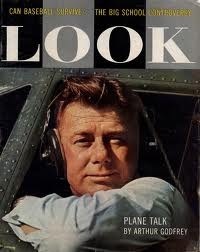 My maestro here was Arthur Godfrey, freckle-faced red-haired ukulele-playing Golden Age radio/TV host. He was the most trusted man in pre-Cronkite America, going by his pitch list: cigarettes, Chrysler, Bufferin, instant coffee, dog food, Reddi-wip, tunafish, Pepsodent and more. He was a tyrant, going so far as to fire one of his ‘Little Godfreys’ on the air, but he had integrity, too, dumping Colgate-Palmolive over ecological issues and Chesterfield over cancer. [Paula Deen, please note.] So when, in the late ‘40s, people griped about the flat taste of the then-new frozen orange juice, Minute Maid got the message and Godfrey got the call. Thus one day on a 7-inch screen TV I saw him gently pour oj from one carafe to another. Aerate it, he said. Works wonders for oj. Did then. Does now. Wine, too. Alors! Revenons à nos moutons. There are nine and sixty ways of constructing tribal lays and aerating wine, and every single one of them is right. Christopher Kimball, the preternaturally boyish Grand Admiral of Cook’s Illustrated, has tested and blessed what I call the Godfrey Multi-Pour. He also [winters are long in Vermont] tried thrashing wine in a blender, but found it just so-so. Also, you can blow air through a straw or use fish-tank aerators. [Home brewers do, but call them ‘wort aerators.’ The one at left, from Williams Brewing, is for platoon-sized parties. 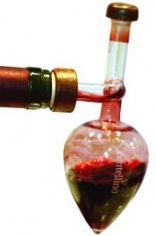 Still, wine loons usually prefer gadgetry. Take Eisch’s Breathable Wine Glasses, please! At $38 each and up. 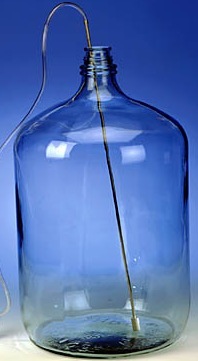 Air is said to enter through the glass itself. Really? For Christmas I got two, one breathable, one plain, so I could compare and, Eisch hoped, be convinced. Good luck with that. I tried to taste a difference but could not, perhaps distracted by the nagging question why? 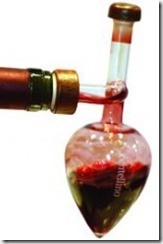 Wine aerates itself in any glass anyway; so what if air enters through the glass? Eisch, undeterred by such quibbles, is now offering breathable expresso cups. Aerators go in the bottle or atop the glass; both came to my party. All work to one degree or another; the sticking point—the bone of contention or apple of discord or fruit of the loom—is how much clumsiness, inconvenience and wounded esthetics you can stand. At Casa Nostra, it’s not much. Thus Owen Petard, masochist and devotee of self-inflicted wounds, has a warm loathing for the Centellino [below]: ‘It’s clumsy and fragile. Stick it in the bottle, pray the stopper holds, then pour one way to fill the teeny bulb reservoir, then pour the other way into your glass. Twice for each glass! And it’s $55—for an overblown version of the pastis pourers beloved of broken-down petanque players in the South of France?’ Metrokane’s Rabbit, is all black and silver plastic, as if sired by some 1960’s Soviet design bureau. Less hideous is the clear-glass onion-shaped aerator called Soirée. The neatest ones resemble pouring spouts and do their work mostly out of sight: The Nuance Wine Finer, Grand Admiral Kimball’s fave, is shown below. It’s much like the Trudeau, Selection and the poetically named True Fabrications. Is forcing air into wine a bit brutal? Jim Ruxin, owner of online’s Village Wine of Brentwood, says ‘Yes, it is too aggressive. It does soften tannins, but it also takes away some flavors and character.’ Others disagree, but Jim’s comment leads me to a point I’ve seen nowhere else: the claim for each of these devices is that one pour will produce a glassful of perfection every time. No way, Rosé! Each device aerates every wine identically, as if all wines were the same, as if all benefit equally from the same degree of aeration. [Vinturi, a bit more refined, has a white-wine version.] Once the wine’s in the glass, there are no Mulligans, no do-overs, no adjustments. Like it or lump it. Thus the Godfrey Multi-Pour beats all: you can aerate as much as you like and stop when you like what you taste.